To me, I believe that if you believe in one all mighty God then you believe in the same God as I do - but your worship is different. 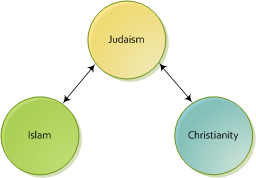 How does Judaism's understanding of God differ from these two other religions? Questions on Mi Yodeya are expected to relate to Judaism within the scope defined by the community. Consider editing the question or leaving comments for improvement if you believe the question can be reworded to fit within the scope. Read more about reopening questions here. If this question can be reworded to fit the rules in the help center, please edit the question.